Set in the neighbourhood of Valmiki Nagar, the breezy Beach is a great alternative, if you want to skip the highly touristy Marina beach. In fact, it is more picturesque and clean, given the fact it is less crowded. The beach is frequented to by those staying nearby for morning and evening walks, but absolutely anytime of the day is a good time to visit the Breezy Beach. If there is any drawback to this beach, is the fact that you have to walk a little more from public transport stations and stops, than you would usually need form other attractions. How popular is Thiruvanmiyur Beach? People normally club together Jagannath Temple Kanathur and Fort St George while planning their visit to Thiruvanmiyur Beach. 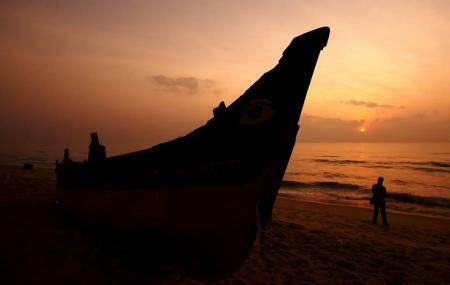 People also prefer to start their day with Thiruvanmiyur Beach. One of the surreal beaches in Chennai. Pristine as people do not litter and try to use the dustbins installed everywhere. On weekends people come here to spend some quality time with their family members. Proper sit outs are there all alongside the road which goes parallel to the shore. You will find many vendors selling snacks and juices. Its not crowded like any other famous beaches in Chennai. You can enjoy the nature with calm and relax at the same time. I would recommend it to visit once. The beach is far far better than other beaches in Chennai. Because of the quietness and the crowd. It's almost less crowded, no shops in the beach but only in the nearby areas and its completely peaceful. One more important additional information is this beach is having a short distance to the sea which means you don't have to walk like in Marina or Elliot's Beach to view the sea. The place is just awesome and the beach is so so beautiful to enjoy with friends and family. A must visit place especially in the night or late evenings in Chennai among the beaches and I liked it totally. Far cleaner than Marina, Elliot's and other locations. The beach has a nearly 1.5 km promenade which is off bound for cars during the weekends and offers a great place for relaxed walks. The sands are cleaned regularly too. Weekdays are relaxed compared to weekends which could get messy with huge crowds. Quite a small beach..the walkers association made a good job of the cleanliness of the beach surroundings. 3 or 4 lanes to reach the beach and one lane is full of snacks stalls...Good place to chill out.. At the end of the beach road one can buy fresh catch of fish from the fishermen. Very neatly maintained. I am surprised to see that plastic is not strewn, as you see in other beaches in India. It would be good if some seating is provided on the beach besides some refreshment points. If public toilets are provided on PPP model, it will go a long way in meeting public needs. The Municipality may consider this along with posting some life guards, since a very large number of people with children are visiting this place.